Located in heart of West Point, PA, The Village Teahouse is a unique experience of fine teas and fare. Enter the world of The Village Teahouse. Join us for a delightful lunch. With a variety of unique tea options and fare, The Village Teahouse is the perfect place to spend your afternoons. The 120-year-old Victorian home has transformed into a sweet and elegant tearoom. 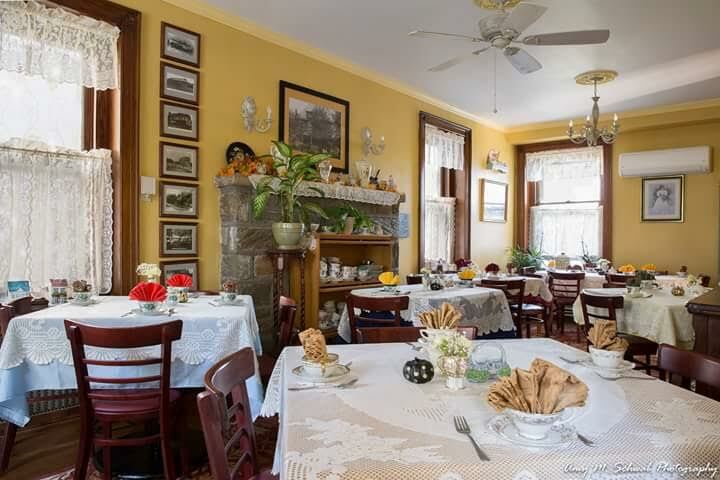 Owner of The Village Teahouse, Margaret Miley Shaffer, has embraced the long history of the house and village and created a tearoom full of character. The restaurant offers the choice of a Victorian dining room or unique themed room, and is able to accommodate parties up to 40 guests. The Village Teahouse is the perfect place to host your upcoming birthday, shower, wedding, anniversary, baptism, and more. Restaurant is handicap accessible. Large motorized wheelchairs may have to transfer. Please note (as we are a small business), we do require $100 deposit on all parties over 8 guests. Voted BEST Tea House in Philly Area! Catch a glimpse behind the vision and making of the Village Teahouse in our featured article by the North Penn Reporter! Read here. With advanced reservations, please let us know if you have any special food allergies or restrictions. Alice in Wonderland Theme Room! Alice is back! Come visit our original theme room for the first time or one of many! You will love the clever art work and ode to this classic tale. The Village Teahouse has its very own book club! Each month features a new book chosen by our own members. We meet every third Thursday of the month st 9:30 to share our thoughts on the latest book. Next year, we are planning a trip to Charleston and Savannah. Call to let us know you will be attending each month. Now booking! The cost per adult is $40 and per child (under 8) is $15. This is our most popular event and seats will fill very quickly, especially for the more popular times. Stay tuned for more events upcoming! Host your beautiful event with us! We host wedding showers, baby showers, birthday and anniversary parties, book clubs, Red Hatters, bible study group meetings, and cotillions just to name a few. Our private events may be held after 2:30 on most Saturdays or on our closed days (Sundays, Mondays, or Tuesdays) for a separate opening fee of $100. We do require $100 deposit to save the date for you. Our dates do fill quite quickly! The Village Teahouse features two private rooms (our Victorian room and our Theme room), which may be made private for up to 40 guests. Call us at 215-699-1800 to discuss how we can make your event unforgettable! Children MUST be able to sit for at least one hour and be well behaved. We ask that all of our guests are courteous to the guests around them. **Parties for children under 13 can only be accommodated as family parties with at least one paying parent to one child. *Please keep in mind, The Village Teahouse is not intended for small children. Our decorations, dishes, and tableware are all breakable. We love youngsters who visit us, especially those who are well-mannered. Party host is responsible for any damage to breakables during any scheduled party. *Reservations can be taken by phone only. Sign up with your email address to receive news and updates about The Village Teahouse. "This is the best teahouse I've been to in America AND England, and I've been to a few. Everything was simply wonderful". "Wonderful place! We can really see all the love that went into making it what it is". "It was such an enjoyable lunch from the moment we stepped in the door. Friendly staff, lovely atmosphere and delicious food". "The word on the streets is that it is 'magical'. Lovely, thanks for opening such a great place for us to come".